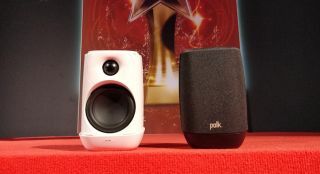 Polk Assist: a £179 Google Assistant speaker | What Hi-Fi? A rather fitting name for a Google Assistant-powered speaker, don’t you think? After launching its Amazon Alexa-enabled Command Bar soundbar last month, Polk Audio is already back on our radar with its second smart (i.e. voice-controlled) product, the Assist wireless speaker. Only this time, the US brand has turned to Amazon's biggest (and arguably only significant) voice control rival: Google Assistant. Polk isn’t the only brand to be covering more than one base by offering both Google and Amazon voice control products, with Onkyo, for example, featuring both Alexa and Assistant smart speakers in its catalogue. The Polk Assist is based on Google Chromecast and Google Assistant, giving owners access to a range of music streaming services (such as Spotify, Google Play Music and TuneIn radio), as well as the means to control playback using the sound of their voice. Naturally, users can also take advantage of Google’s complete voice control skill set, whether that’s to turn compatible smart lights on or off, or ask for the weather. Chromecast functionality also means the Assist can connect to several individual or grouped Assists or other Chromecast-toting speakers - Polk would invariably point you to its MagniFi Mini and MagniFi Max – to create a multi-room set-up. Here, Polk is clearly taking aim at the hordes of already-available smart speakers in the market, such as Google's own Home offering, promising to offer a step-up in sound quality over its rivals. To help the Assist achieve that is a 2.5cm tweeter and 7.5cm mid/bass driver, which you can see exposed in the photo at the top of this story. On the top panel are volume and play/pause button, an action button to activate the Assistant without having to say “Google”, and a 10-LED strip to indicate volume level and when voice control is activated. A mute button sits at the unit’s rear, too. A final word on design: Polk has applied a stain-proof coating on the Assist’s grille (which can be removed and replaced), so those using the speaker in the kitchen needn't refrain from any haphazard pouring of olive oil near it. At £179, the Assist comes into the flourishing smart speaker market competitively priced next to the five-star Apple HomePod, but it'll still have to get past the equally formidable, more affordable Sonos One (£200) to make any kind of lasting impression. We hope to discover its fate soon after it hits UK (and US) shelves in July.